Nha Trang Railway Station is located on the north-south Reunification Railway Line, 427 km to the north of Saigon Railway Station in Ho Chi Minh City. Nha Trang Railway Station is located 500 metres walking distance to the west of Long Son Pagoda and 1.7 km from the Tower Incense in the centre of Nha Trang beach. Nha Trang Railway Station is a relatively small and unattractive station built in the early 1900s, and not 1832 as some sources suggest, which is obviously incorrect as the first trains did not start operating in Vietnam until 1881. The station was constructed by the French Public Works Department at a time when Nha Trang was first starting to become popular as a seaside resort. Despite the subsequent very large increase in the numbers of people visiting Nha Trang very little investment has been put into improving Nha Trang Railway Station since the time it was first built. 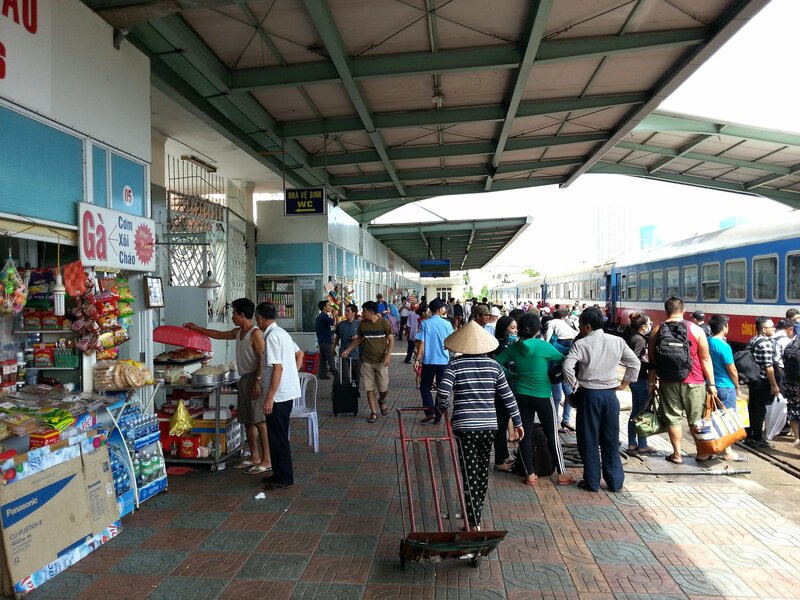 Nha Trang Railway Station gets very busy during peak holiday season in July and August. If you are planning to get a train from Nha Trang turn up at the station a short time before your train is due to depart as there is not enough seating for everyone, and very few toilets. 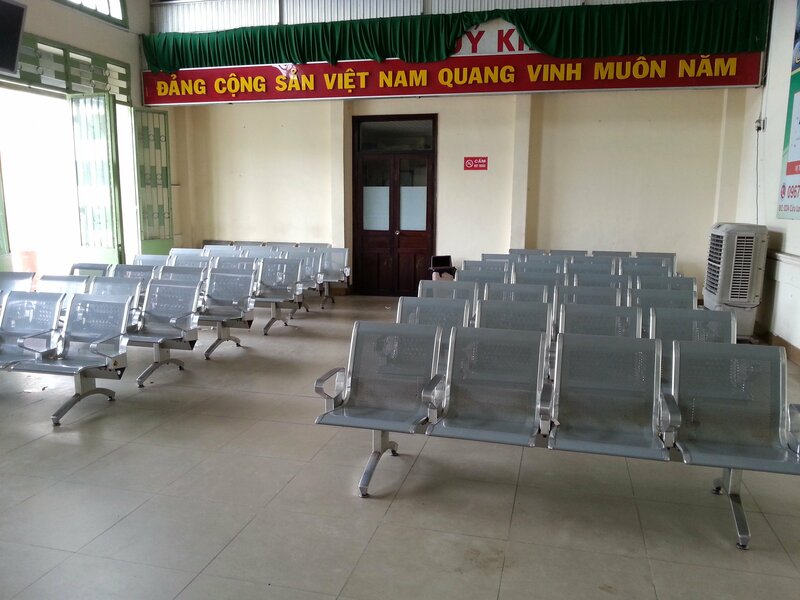 Vietnam Railways provides few facilities for travellers at Nha Trang Railway Station. The station has a large waiting room and three mobile ‘portacabin’ style toilets on the main train platform and that’s all. You can, however, buy drinks and snacks (including beer and vodka) from the privately operated kiosks located on the main train platform. For a better range of food and drink we suggest that you head out onto the main road going towards Long Son Pagoda. If you do have time to wait for a train we recommend visiting Long Son Pagoda, which is free to enter and has a fantastic vegetarian restaurant near to the entrance to the temple. From Nha Trang Railway Station it takes around 7 minutes to walk to Long Son Pagoda. 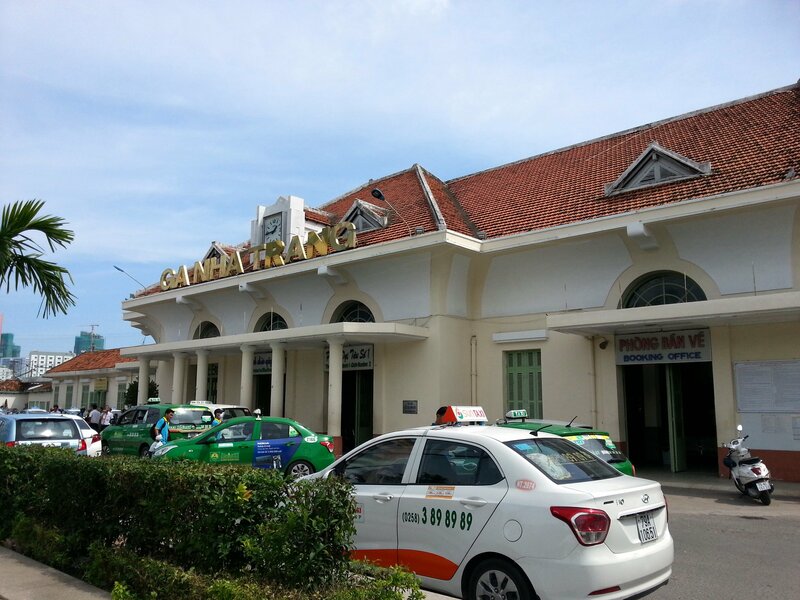 There are always lots of taxis waiting out side Nha Trang Railway Station whenever a train arrives if you need some help transporting your luggage to your hotel. Before you consider taking a taxi check where your hotel is in relation to the railway station as much of the accommodation in Nha Trang is within easy walking distance of the station, just remember to make sure you have access to a map. There is a large ticket hall at Nha Trang Train Station located to the right hand side of the main entrance to the station. When you enter take a ticket which will give you a number in the queue to buy tickets. The display screen above the counters displays the ticket numbers which will be served next. The counter staff at Nha Trang Railway Station have fairly good English language skills, but are unable to speak Russian or other langauges. If you want to find out more information about seat types and other journey options we recommend that you book your ticket online using the Search Box below. Booking in advance is particularly recommended if you plan to travel during high season and you want to book a sleeper seat. For destinations other than Da Nang, change the destination in the Search Box by typing in the first few letters of the place you want to go to and using then use the drop down list to select your destination. There are 11 daily train services from Nha Trang to Saigon (also known as Ho Chi Minh City). Buy train tickets from Nha Trang to Saigon. There are 6 daily train services from Nha Trang to Da Nang. 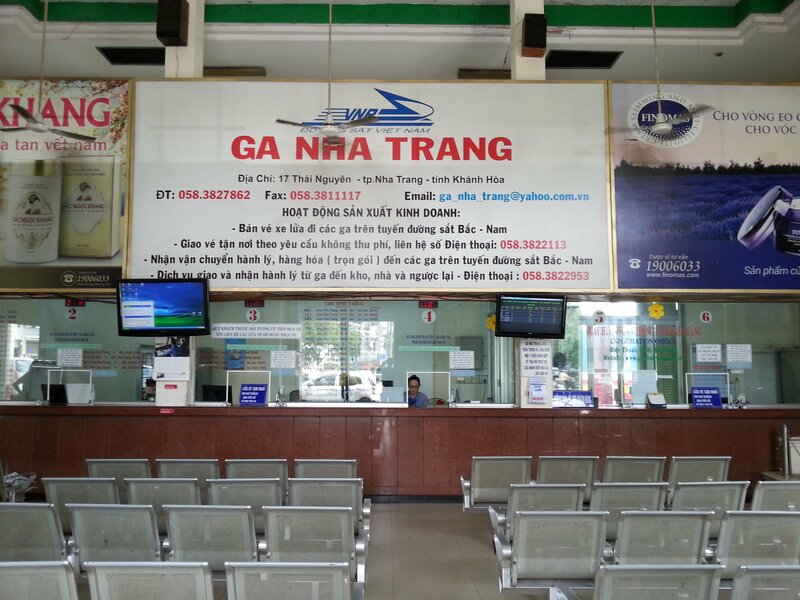 Buy train tickets from Nha Trang to Da Nang. 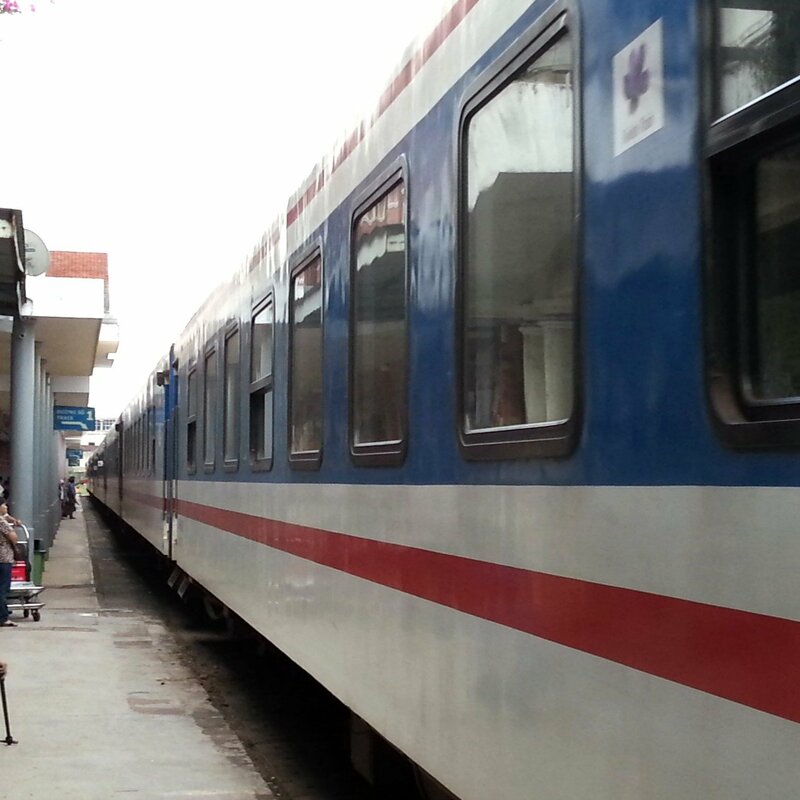 There are 6 daily train services from Nha Trang to Hue. Buy train tickets from Nha Trang to Hue.